Based on my review of vegan nutrition books, you can tell why I always try to eat a lot of beans. 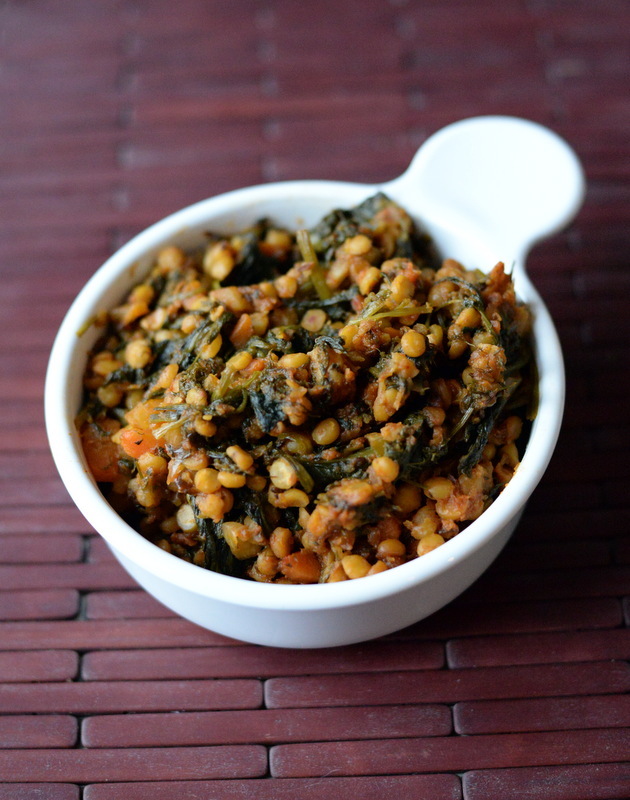 So much so, that when I travel and people want to know what I eat, I tell them that something as simple as vegetables and a can of chickpeas would suffice. My family is actually really good about making sure there is food for me, but I still have fun cooking in the kitchen while travelling. What did you think of the nutritional recommendations from the review? Do you feel like you eat enough of the different areas? This is my submission to this month’s Bookmarked Recipes. PS. The winners for the nutrition books are: Rachel with Vegan For Her and Moo with Becoming Vegan Express. Congratulations! 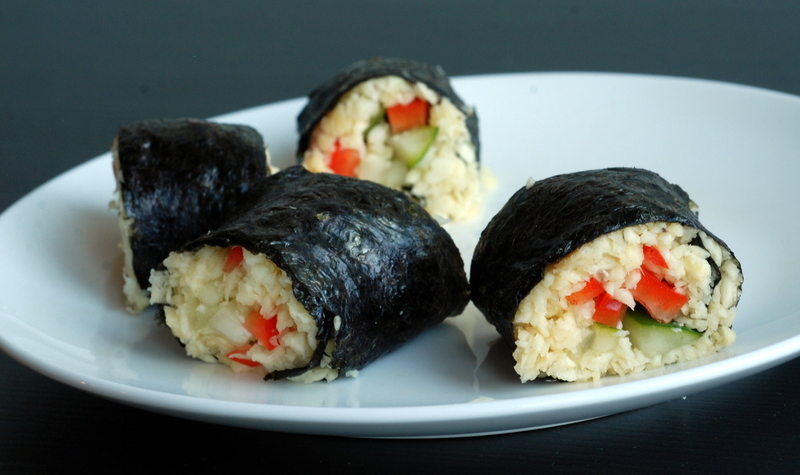 Parsnip Rice Sushi with Sweet Tamarind Dipping Sauce & Cookbook Giveaway! I have been very fortunate to grow up in an environment where brains were valued over beauty. None of my friends were ever on diets. If I made New Year’s Resolutions (I doubt I did; my last decade has been more of a daily self-evaluation), they were short-lived vow to be nicer to my brother. My mother (and brother) may not believe me. It was only after I started reading food blogs, did I encounter the dizzying world of detoxes, cleanses and diets. Not that I have ever condoned detoxes. Barring liver disease or overdoses, our liver does a great job “detoxifying” our body every.single.day. Imagine my surprise when not one, but two of my friends in Houston told me they were eating 100% raw shortly after New Year’s, spurred by Kristina’s 21-Day Raw Challenge. I love the creativity that comes from cooking/uncooking/eating raw foods, but they complement my cooked vegan eats. Let’s be honest, even in Houston, winter is not the ideal time to go all raw. My friend hosted a potluck to kickstart her first day on her raw diet and this is what I brought to share. I used it as an opportunity to make something from a new cookbook, Balanced Raw. 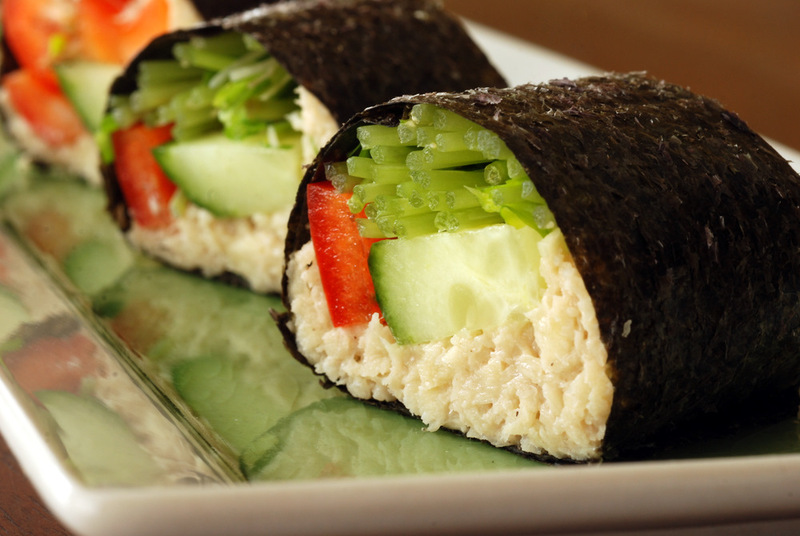 Raw sushi is easy to share at a party, so I tried the new recipe. I have made raw sushi before, and the recipes are quite similar, but I decided to share this version, too, mainly because Rob took some impromptu sushi rolling action shots. Using a placemat makes sushi rolling very easy. 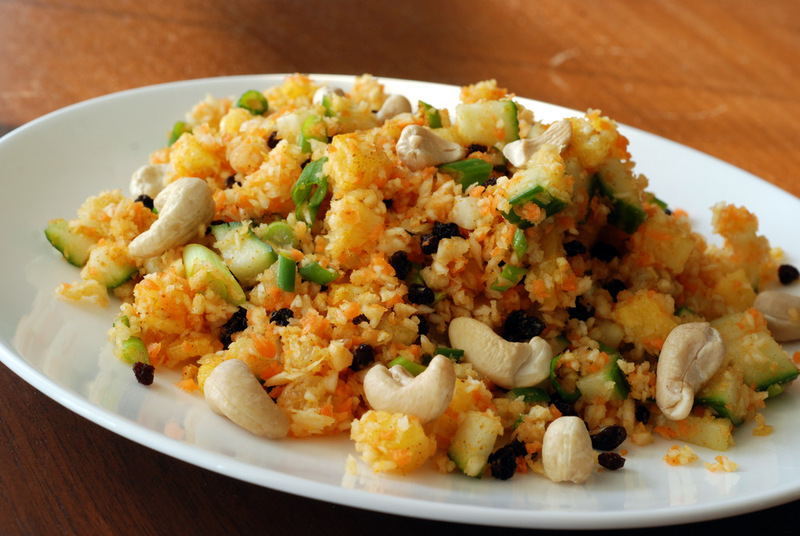 Parsnip rice is spiced with a bit of chile powder and filled with an assortment of vegetables. A note about the cookbook, though. 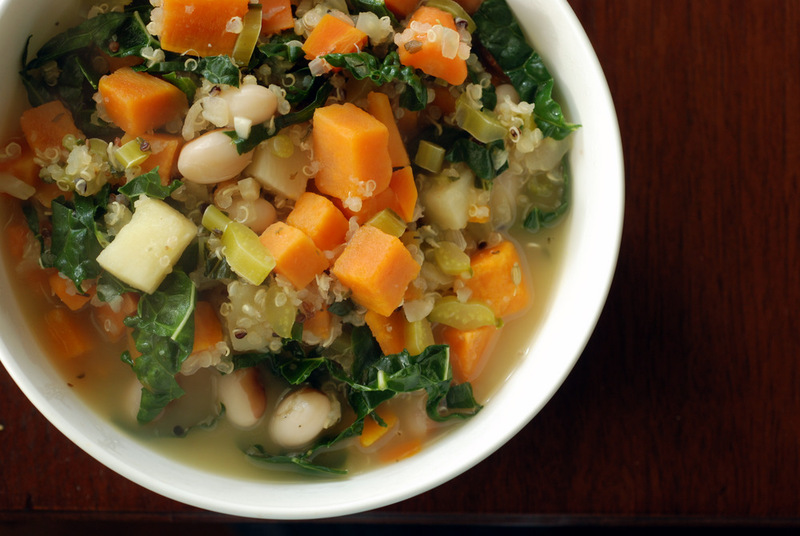 The recipes are built around a 3-week vegan “cleanse” with a meal plan for every day. The recipes span both raw and cooked meals, but they seem to follow a low-fat 80/10/10 vegan diet. While Kristina is good about mentioning the need to eat enough calories, the meal plans in this book look woefully inadequate calorically. However, the recipes are interesting and would be a useful adjunct to whatever your typical eats may be. There are ideas for vegetables beyond salads. I use raw foods to enhance my vegan diet. It is a great way to eat more vegetables and fruits. The publisher is letting me give a cookbook to one reader living in the United States, Canada and the United Kingdom (YES!). To be entered, please leave a comment here, telling me what you think about cleanses and detoxes. Have you done one? Are you doing one? I will randomly select a winner on January 20, 2014. Good luck! This is my submission to this month’s I Am Vegetarian – Hear Me Raw, and this week’s Raw Foods Thursdays. PS. There is still time to enter my giveaway for Superfood Smoothies here. You saw the writing on the wall. 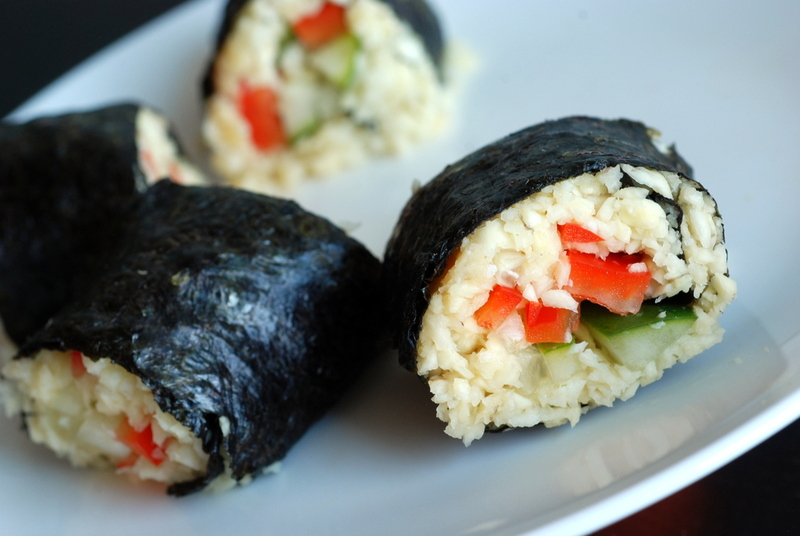 With my love of wraps, it was only a matter of time before I made sushi rolls. It took me a few tries, but I finally found not one, but two recipes that I really like. Am I the only one who scopes out a bunch of recipes for a particular dish and then can’t decide what to make? Should I go with option A or option B? Sometimes, I decide to hedge my bets and make multiple options. That’s how I ended up with 2 versions of my chocolate black bean cookies and oodles of combinations for my savoury flax-hemp crackers. Half a recipe for you and half a recipe for you… which means the bonus of 2 recipes for me! This explains why my recipe says it serves 1. I boiled down each sushi roll to fit one parsnip with its seasonings. The fillings could easily be doubled, tripled or quadrupled, but please, please, please don’t assemble these babies too far in advance. 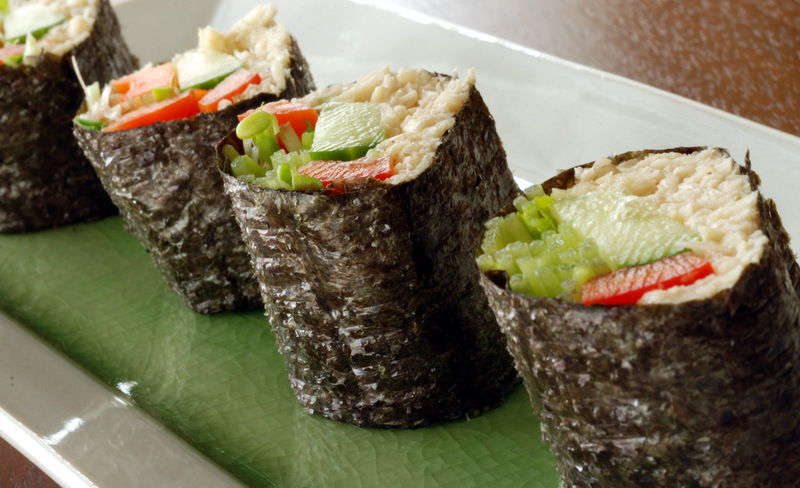 The nori sheet will become limp and soggy…and no fun. To be fair, my first venture at a nori wrap was from Color Me Vegan with an orange-cashew cream sauce. I have become spoiled because that cashew sauce was nothing compared to my previous Zesty Cashew Orange Spread. 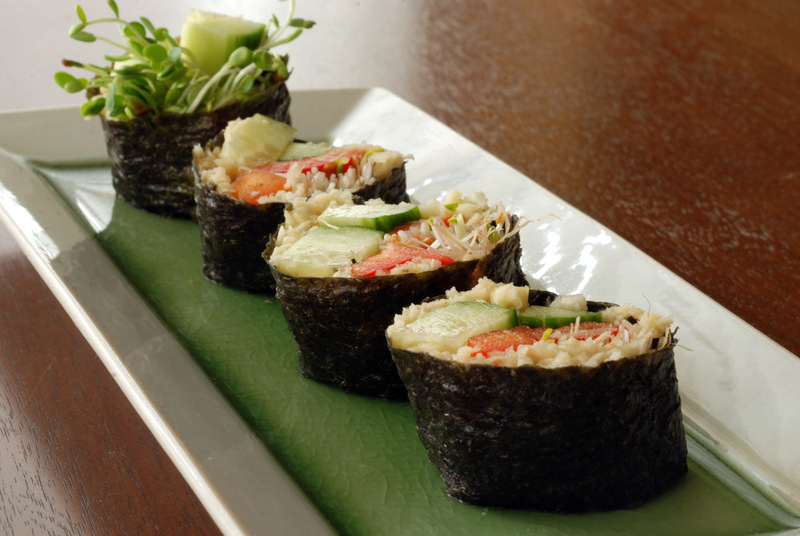 The rolls seemed a tad lacking, especially since there wasn’t anything that reminded me of a standard sushi roll. Having really enjoyed the parsnip in Raw Thai Pineapple Parsnip Rice, I knew that this was the way to approach raw sushi. Then I had to decide- nut butter-version from Gena or miso-version from Lauren? I have had some really heavy sushi rolls at raw restos because they make the rice from nuts, so I was excited to try the lighter miso version. I was torn, though, because I was still drawn to Gena’s recipe since the butter seemed to accentuate the parsnip rice. So, I made both and glad I did because they were both different yet equally delightful. 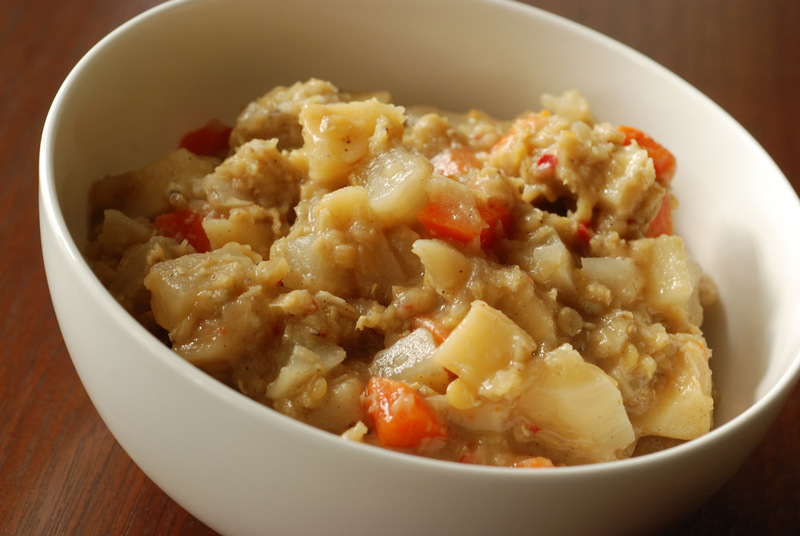 The miso version was light and flavorful and worked well with the multitude of veggies. It reminded me of my citrus-spiked sushi rice bowl with the miso twist. I am not sure the oil was completely necessary so I may remove it next time. The tahini version was heavier but incredibly flavourful from the tahini and the touch of toasted sesame oil. They were both filling as a light lunch. 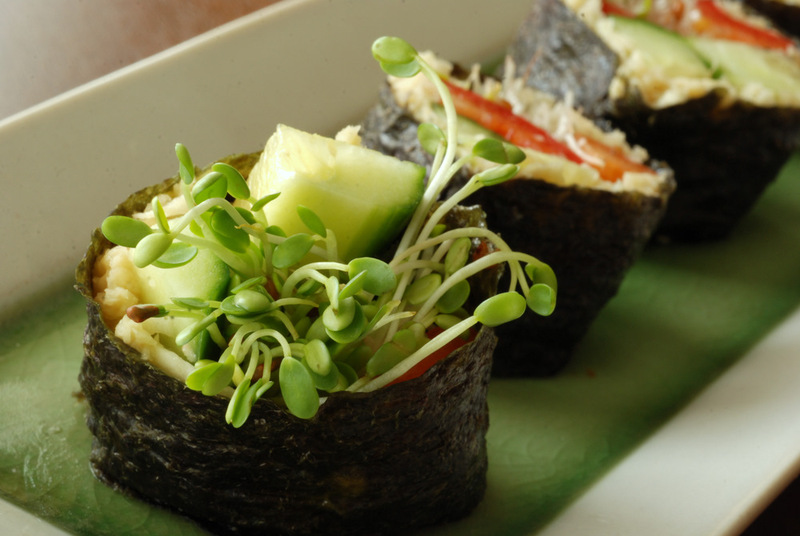 If you haven’t yet made raw sushi, don’t be shy. You certainly don’t need a special sushi rolling mat. Just a great filling. It is what is inside that counts, and I’ve got you covered. Twice. Two hugs, as Rob would put it. This is my submission to this month’s Pantry Party for quick foods. I don’t know about you, but sometimes I reflect on where I have been and I wonder how I managed to pull through. How did I manage to survive 4 years of medical school? Nearly 5 years of residency? Cycle between Ottawa and Kingston and back again? In the thick of it: I don’t think, I just perform. Meals stashed in the freezer are a definite boon these days. However, I find cooking therapeutic. A way to destress as I chop and julienne vegetables, stirring patiently as I saute onions or peacefully munch through the leftovers. This is my submission to this week’s Weekend Herb Blogging, hosted by Marta. A new home; a new 5 keys. Trust me, I am not complaining about now having a garage. Although 5 keys is certainly overwhelming. First front door, second front door, rear door, garage door and garage. While we are still unpacking boxes, and likely will for many weeks, the kitchen is functional. The bedroom is almost unpacked (minus my clothes) and we have no idea what to with ourselves now that we have 3 bathrooms. In any case, while Rob and I have moved many, many times before, this is the first time we hired movers. So completely worth it. Our friends and family must think so, as well. 😉 Our movers were work horses: incredibly strong, super fast while still being very gentle. One of the movers relished telling me a new joke every time he saw me. If anyone needs cheap, efficient movers in the GTA, shoot me an email and I’ll give you their contact info. For one of my first meals in the new home, I decided to break in the kitchen with a quick and easy stir fry. I also inadvertently christened the kitchen by setting off the smoke alarm. I swear, there was nothing burning! I will have to be careful to not wake up my neighbors. I adapted Hugh Fearnley-Whittingstall’s Winter Stir Fry with Chinese Five Spice to what I had left in my vegetable crisper. Winter root vegetables are fabulous for keeping so long, but it felt nice to use up the remainder of my root veggies, along with some spring veggies. Goodbye winter, hello spring. 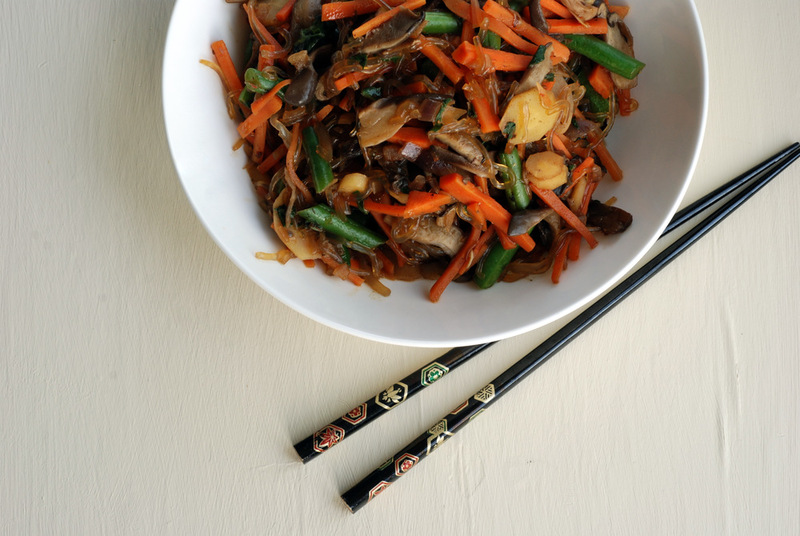 The heart of this stir fry is the Chinese Five Spice powder, which stems from the heart of Szechuan cooking. It is aromatic and savoury, composed of star anise, fennel seeds, cinnamon, cloves and Szechuan peppercorns. A seven spice blend may also include ginger and black peppercorns. A complex spice blend, a little goes a long way and really shines here. 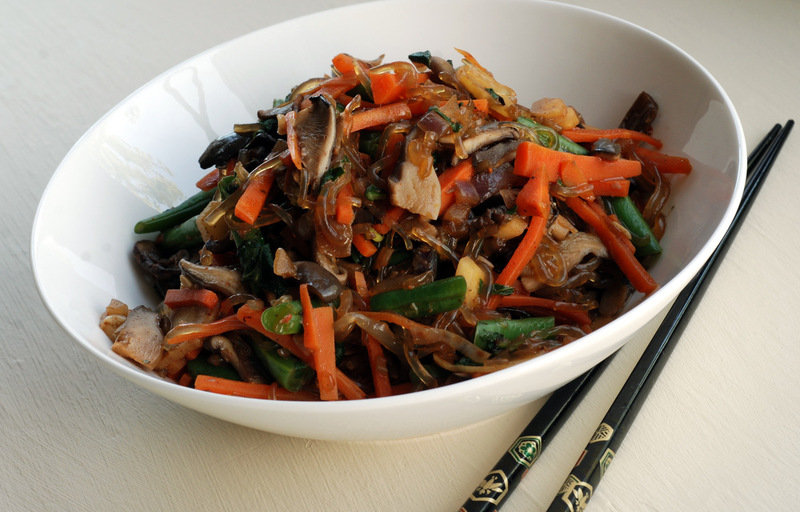 Throw in your own favourite vegetables with some noodles and then toss with a sake, tamari and Chinese five spice dressing. The drizzle of lime at the ends adds the perfect acidic balance to the veggie-centric meal. Feel like more protein? Add some tofu or tempeh. Me? My pantry is all cleaned out of tofu! While I had been working through my pantry prior to this move, I plan on eating through the remainder over the next year before our BIG move to the US. 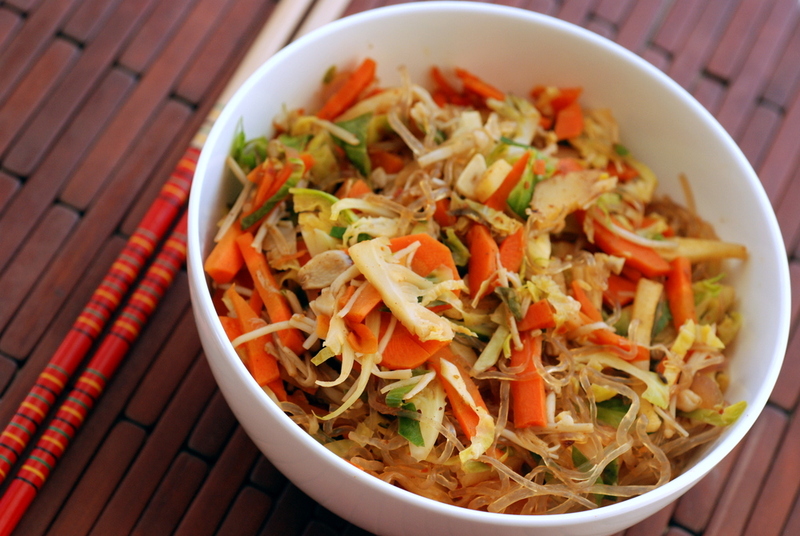 Expect to see more recipes with kelp noodles! What are your favourite ways of eating them? This is my submission to this week’s Presto Pasta Nights, hosted by Ruth, to this month’s pasta bloghop, to this week’s Weekend Wellness, Virtual Vegan Potluck and to Cookbooks Sundays. When I finally made it to Penzeys in Boston, I caved. For so long, I have been meaning to make my own curry powder but instead I went with a packaged blend. 660 Curries has not 1, not 2, not 3 but 20 different recipes for curry powder and spice blends. Where’s a girl to start? Understandably, I was a bit overwhelmed. I didn’t know which one would be best for me, a lover of non-curry, so instead I opted for the sniff test. I smelled all the different versions at Penzeys and ultimately bought their “Sweet Curry Powder” (I wish cookbooks had the sniff test, *sigh*). It has that quintessential curry note but it isn’t overwhelming. I still haven’t figured out which spice I am averse to, but thankfully, this blend is a keeper. It is super mild, so I even feel the need to supplement it with some Aleppo chili flakes. As you can see, I am on a raw food kick and yes, you can make simple, raw foods sans dehydrator, too. 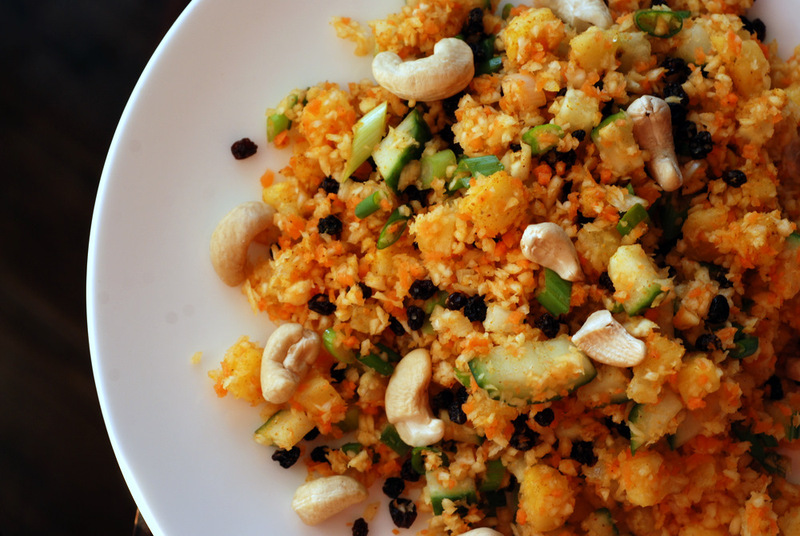 I was intrigued by Susan’s Raw Curried Pineapple Rice. Who needs the fried rice found in the typical Thai recipe? Give me veggies any day! 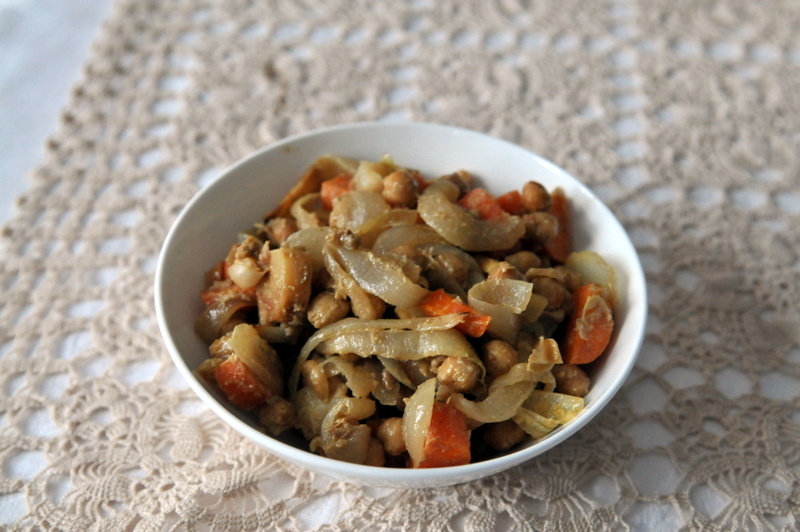 Let your favourite curry powder lightly dust a smattering of sweet vegetables. 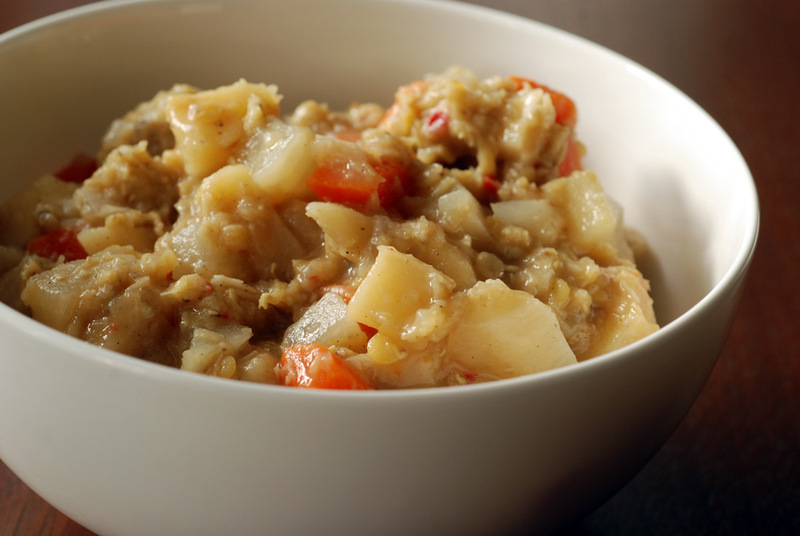 Here, parsnips and carrots are chopped fine in the food processor until they resemble rice, or small-grain couscous. Diced cucumber and pineapple add juicy sweetness along with the currants. Green onions give this more kick than the curry powder. The lime juice makes this really pop. If you don’t really care about rawness, toast your cashews and add them right before you serve the dish. I can see myself taking this lovely salad to potlucks this summer for something different. This is my submission to Deb for this week’s Souper Sundays, to this week’s Weekend Wellness, and to this month’s Sweet Heat Challenge, featuring Thai foods. This Red Lentil and Root Veggie Dal came from Appetite for Reduction (recipe here) and I thought Rob would like it- a red lentil curry, complete with ginger, curry powder, coriander, cumin, cardamom and cinnamon, complemented with a host of root vegetables: carrot, parsnip and turnip (did you spot the cruciferous vegetable?). 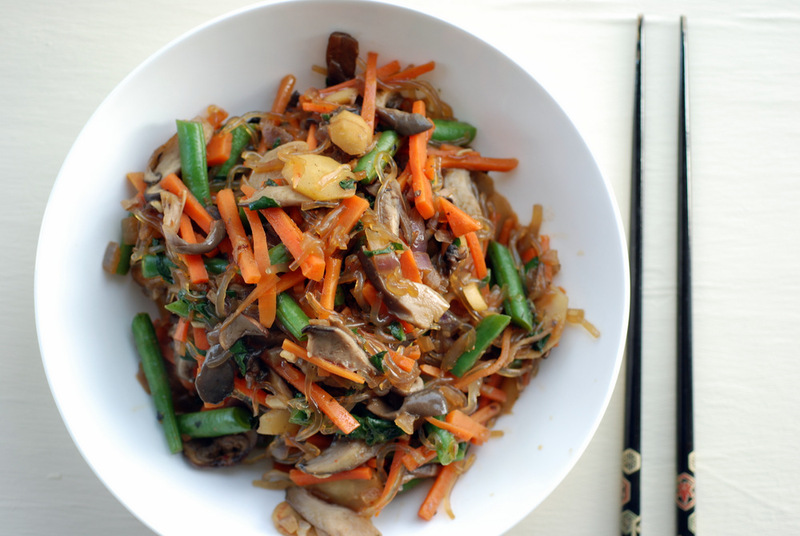 A quick and healthy recipe, it was also up my alley. Turns out the word curry threw Rob off – he found it to be blander than anticipated. Meanwhile, I adored it! This time, I snatched the leftovers! 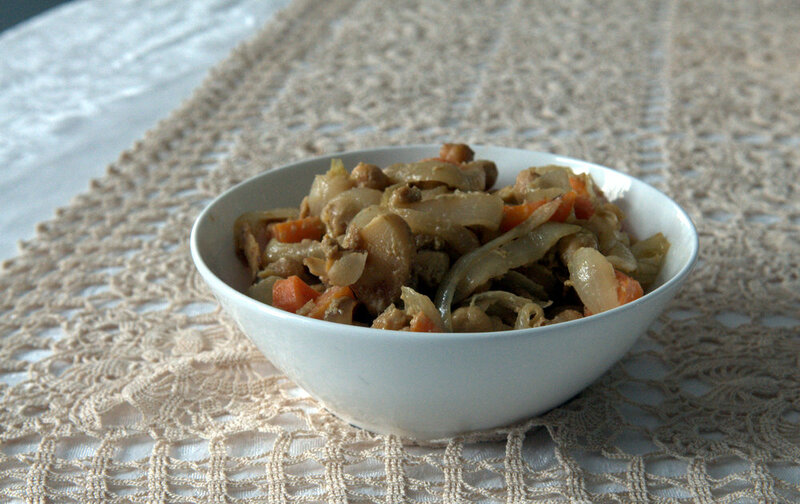 The vegetables make this a sweet curry and I thought this complemented the savoury spices well. For the curry novices out there, there was no hint of curry powder taste… unless you decide to add more! I found this perfecto as written. This is my submission to Deb for this week’s Souper Sundays to Ricki’s Wellness Weekend. For once, my Mom could snicker that her grocery store was better than mine. You see, I was on a mission to buy parsnips to make this stew. My trusty Sunny’s didn’t have any. I found parsley root, with beautiful parsley leaves attached to it. It looked almost identical to a parsnip, which to my eye, is a white carrot. However, they don’t taste the same. Good thing I didn’t buy it! I had to venture to a “normal” grocery store. Or T&T, since they have parsnips. I bet the Farmer’s Market would have some, too. While we’re at it, let’s push the boundaries some more (truthfully, parsnips are not that adventurist for me). I don’t like licorice but like tarragon. Why not try fennel? 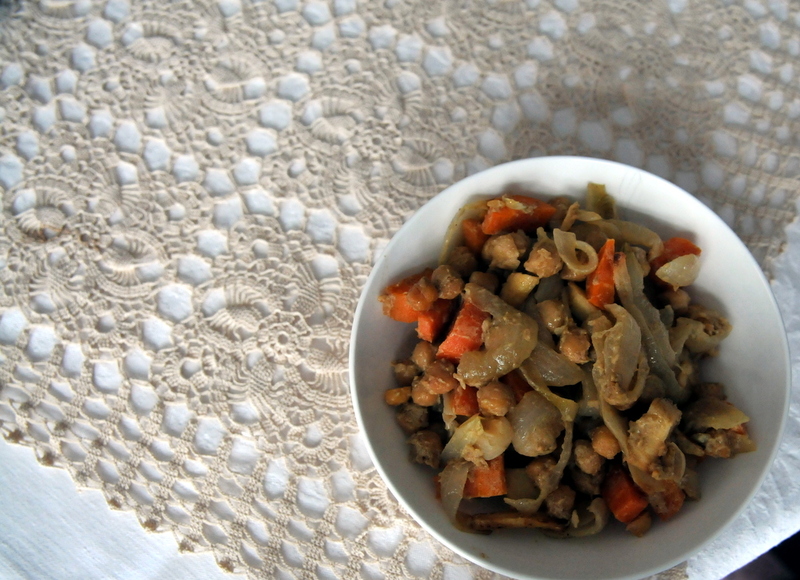 I am so happy I tried it, because I loved this stew, fennel and all! 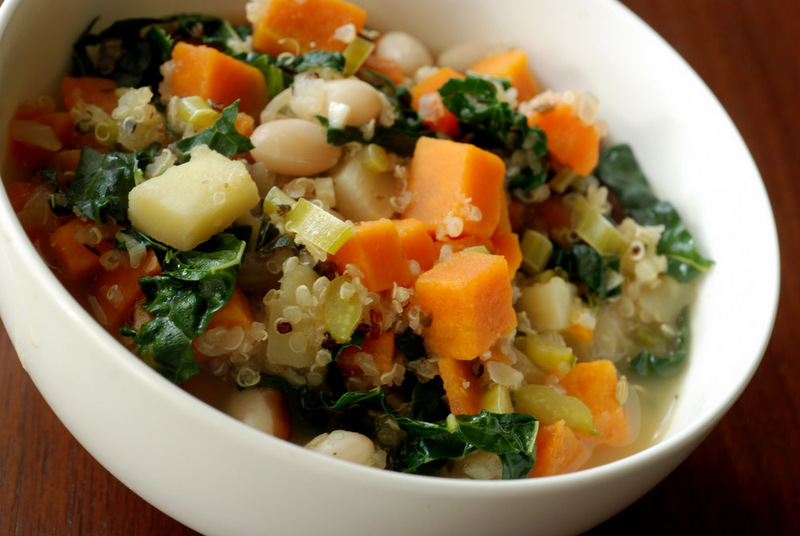 Continuing with my white bean kick, and my abundance of kale, I modified Isa’s Quinoa, White Bean And Kale Stew from Appetite for Reduction. I thought it might be plain and boring, but it was anything but. It was sublime. 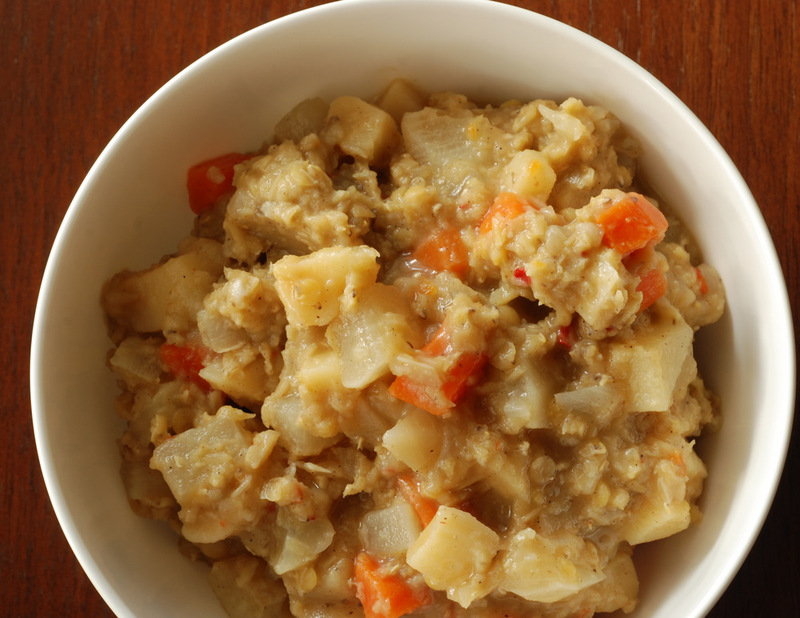 A great, comforting stew with tons of mellow flavours without bogging you down. I substituted the leek for onion and fennel, swapped the white potatoes for sweet potatoes, upped the carrots and parsnips and used up the last of my kale including the stems, which was only 1/2 lb. Thankfully, this soup makes a ton. I will be slurping it up all week and then some! This is my submission to this month’s Simple and in Season, to this week’s Healthy Vegan Friday, to Deb for this week’s Souper Sundays, to Ricki’s Wellness Weekend and to both Ricki and Kim’s vegan SOS challenge featuring parsnips. My friends recently hosted an international-themed potluck. Everyone brought a dish from another country. A real melange of flavours. While most of my cooking comes from an international menu, I used this opportunity to try a cuisine I knew next to nothing about: Indonesia. While I have cooked with tempeh, fermented tofu originating from Indonesia, I didn’t really know much else. 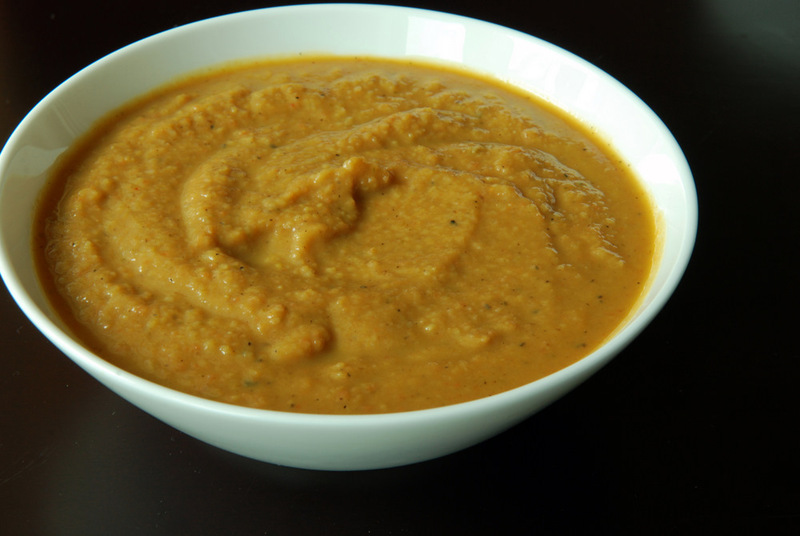 At first, I wasn’t sure how this would be a spicy soup: I substituted garam masala for the curry powder and was only using a small amount of chili flakes for such a large amount of soup. Have no fear, this is a zingy soup with all the right amount of zing. The culprit? The savior? Half a cup of grated ginger, tempered by the peanut butter. Boo-yah! Joanne pointed out I was on a ginger kick, and yes, I am loving it! 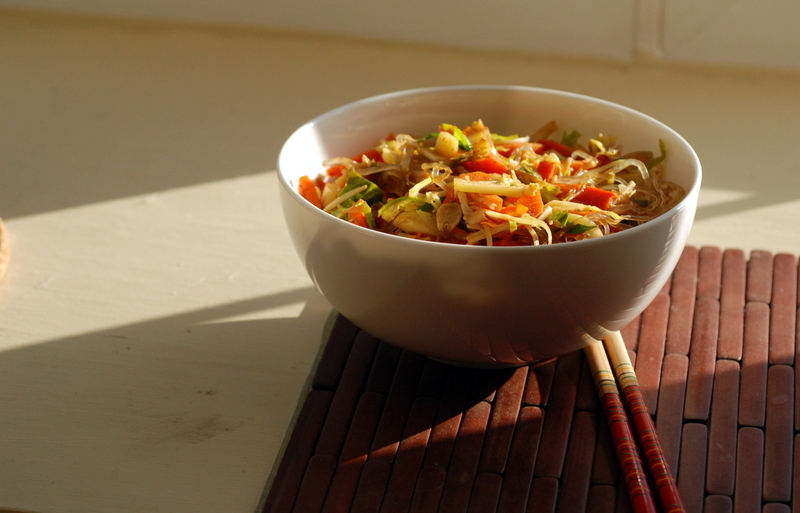 This soup has a great mix of flavours – warm yet spicy, creamy yet light, zingy and sour. Soups get the shaft in the summer, but I think they are great any time. Share this with friends, because it makes a lot of soup. It also freezes well. This is my submission to My Kitchen, My World for Indonesian travels, to this month’s No Croutons Required for blended soups, to E.A.T. World for Indonesia, and to Deb for this week’s Souper Sundays. 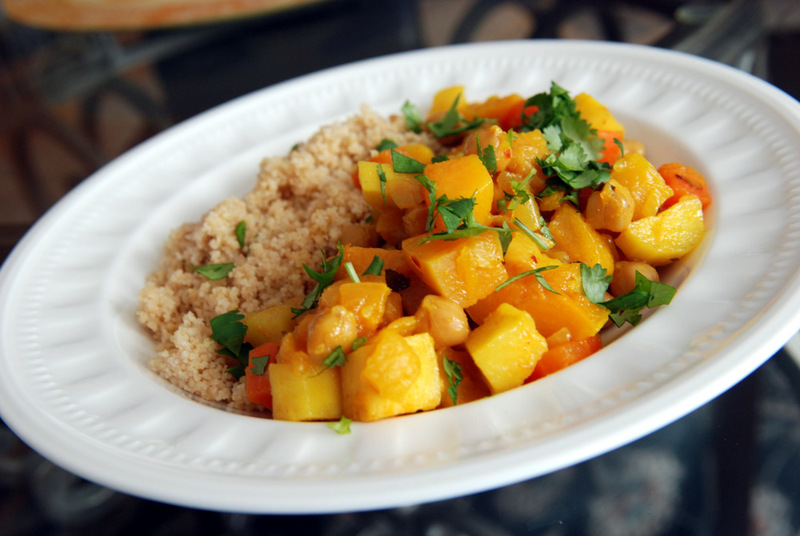 It has been nearly 3 months since I have returned from Morocco and I am surprised I have yet to post a Moroccan dish. I will admit that I was a bit sick of Moroccan cuisine after being profoundly immersed into it for 2 weeks straight. For every meal, I would seek out a new dish that I hadn’t yet tried. As we meandered from Casablanca, to Marrakesh, through the Berber inland towards the Sahara desert, up to Fes and Meknes, there was always something new to try. However, it was mostly meat. I remember asking if I could get a couscous dish without meat, and the waiter told me I could have it with chicken instead. That’s not what I had wanted, either, actually. My friend and I scoped out some vegetarian restaurants (Clock Cafe in Fes, and Earth Cafe in Marrakech), but vegetarians options (nevermind vegan options) were hard to come by. So, I plunged myself into Moroccan culture, and ate like the Moroccans. And ate my meat quota for the year. 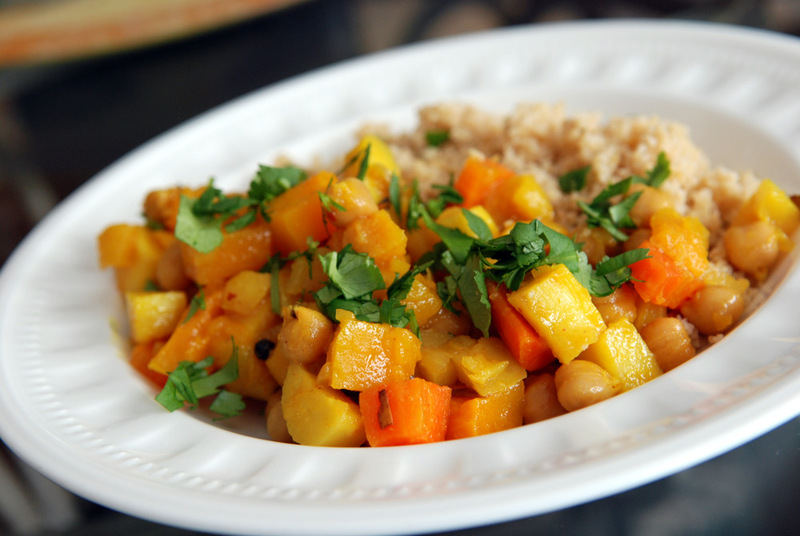 However, perusing the web, there are bountiful recipes with exotic Moroccan-spiced vegetarians dishes. I just didn’t find them in abundance while in Morocco! While I still have yet to recreate the traditional flavourful and spicy chickpea and lentil Moroccan soup (harira), I busted out nearly everything in my spice cabinet to create this ultimate winter couscous (christened as such by Yotam Ottolenghi). I adapted the recipe I found in Plenty, but a similar recipe was originally posted in his column at the Guardian. 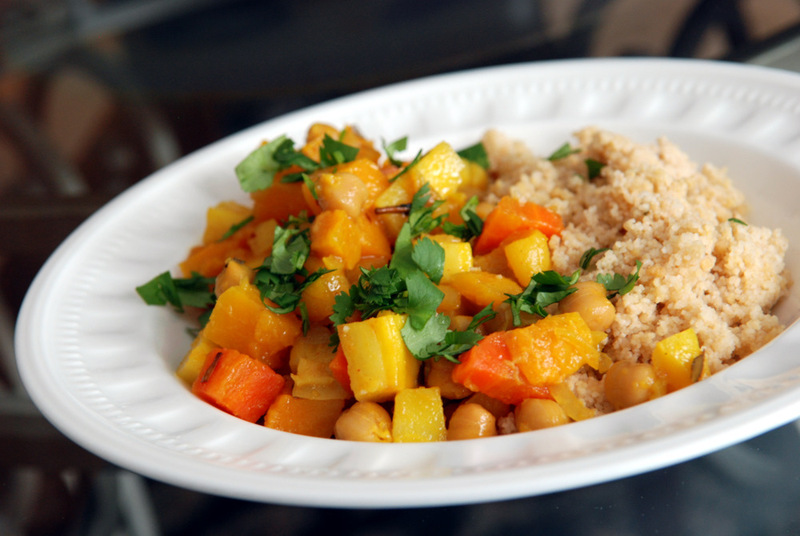 At the same time both savoury and sweet, it embodies my favourite aspects of Moroccan cuisine. The base of the vegetable tagine is made of butternut squash, carrots, parsnips and chickpeas and it is pleasantly spiced with cinnamon, ginger, sweet paprika, bay leaves, turmeric and chili flakes. It could be made even hotter with harissa, but I opted to keep it more tame. 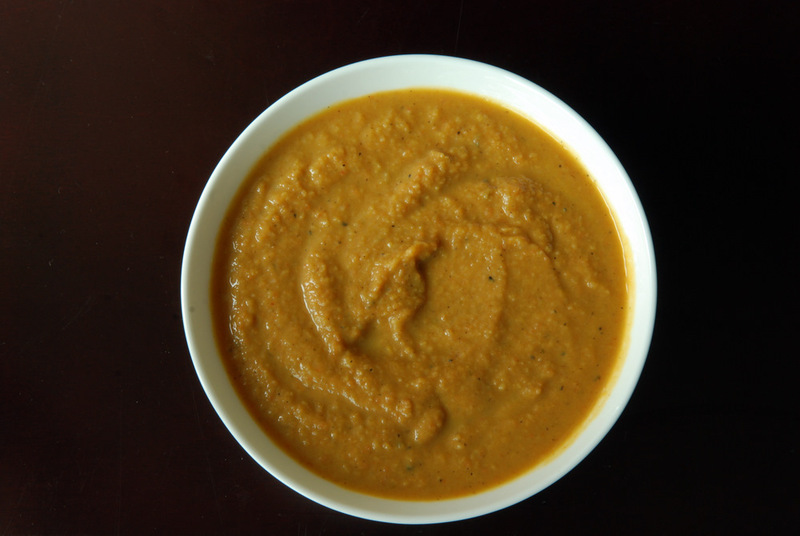 The sweetness comes from the dried apricots which are simmered in the broth with the spiced vegetables. Feel free to sprinkle with fresh lemon juice, or use the suggested preserved lemon. 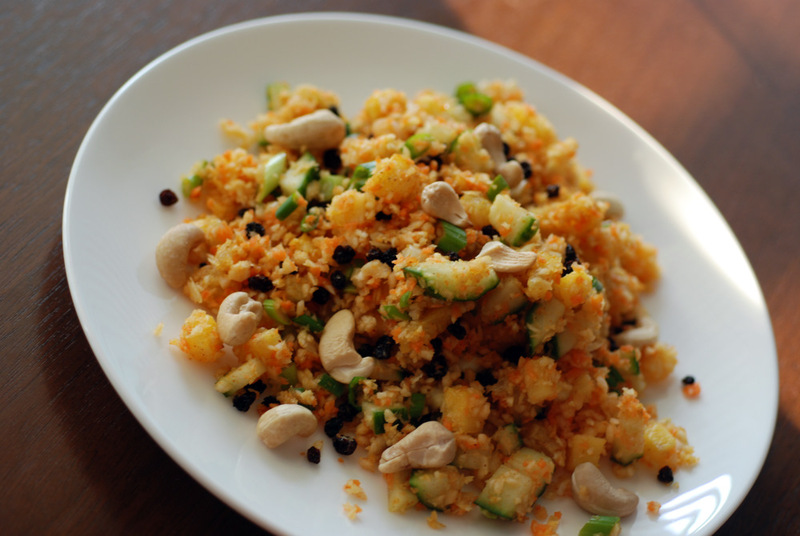 Couscous is prepared separately, but once combined, you have a good textural contrast. Chopped cilantro adds the fresh, finishing touch. 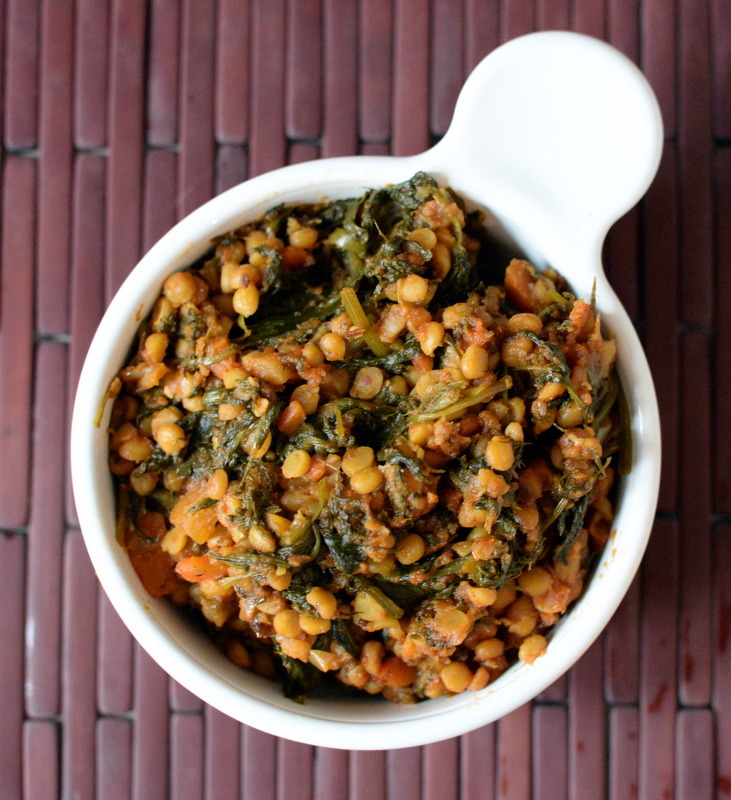 This is my submission to Deb for this week’s Souper Sundays, to this month’s My Legume Love Affair, hosted by Ammalu’s Kitchen and E.A.T. World for Morocco.